TDmonthly Magazine Products by FUNRISE INC. The Strong Arm Fire Engine is a new free-wheeling vehicle with a multi-action trigger-lever built right in. Pull and rev up the lever and watch the sparks fly in the arm’s window as the siren wails. Squeeze the lever’s trigger to raise the fire engine’s ladder. This sturdy vehicle is kid-powered with plenty of playtime action. Kids can watch a Gazillion bubbles soar into the air with the Gazillion Bubble Rocket. They simply pour Gazillion Bubble solution into the tray of the launch pad, place the rocket on the launcher, and with stomping power, launch the bubble rocket for a bubble trail of sky-high fun. The product comes with a cool rocket, a launcher, a stomp pad and 6 oz. of Gazillion solution for continuous rocket-fueled action. No batteries are required. Launch date: 2009. Set the Shake ‘N Bobbles Racer into the cockpit, place the car onto the launch ramp, hit his head and let him rip through the Shake ‘N Bobbles junkyard track. With a different feature on each section of track, you’ll never know what to expect with this wild ride! These hands-on free-wheeling vehicles with oversized Tonka tread tires are equipped with pump action tools that squirt water from the attached hose. Flip targets are also provided for practice! 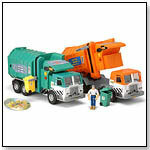 Choose from a Fire Truck or Tanker Truck. Now you can command the sand with Tonka Sandbox Force Trucks. These free-wheeling vehicles are built for any size job with large Tonka tread tires that leave impressions in the sand. Comes with bonus sand tool! Test your free throw skills with the HEADBANGERS Big Hoops basketball player. Set up your basketball hoop, place the ball in his palm, aim and bang his head to shoot for 3 points! Available Fall 2008. The Gazillion Bubble Trucks are great little bubble buddies that you can carry around and create streams of colorful bubbles just by pressing the handle. The hood lifts up automatically to blow streams of colorful bubbles. Batteries required. This battery operated Adjusta Bubble Gun comes complete with 2 oz. of the one and only Gazillion bubble solution. Just press the on switch, pull the trigger and blow BIG bubbles or small bubbles all with the switch of a button. It’s hunting season all year round with HEADBANGERS Big Hunter! Set up your target, adjust Big Hunter’s arrows by moving his arm up/down or side to side, and bang his head for a perfect shot every time! Available September 2007. Blow a Gazillion bubbles with Nemo. Simply pour Gazillion bubble solution into the reservoir, switch it on and watch your bubble buddy blow a stream of colorful bubbles. Includes 4 oz. of the one and only Gazillion bubble solution. Requires 2 C batteries, not included. 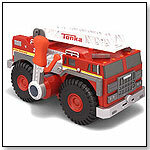 Tonka Flashlight Force are free-wheeling vehicles with built-in flashlights. Based on the most popular vehicles Fire Engines (featured), Tow Trucks and Dump Trucks. The Tonka Light Command Dump Truck is a light activated vehicle with light and sound features and a and a removable flashlight. When the flashlight is aimed at the vehicle's light sensor, the vehicle's motorized functions are activated. The flashlight snaps easily back on the vehicle for convenient storage and transport. The Tonka Light Command Sanitation Truck is a light activated vehicle with light and sound features and a removable flashlight. The bonus is the motorized functions are activated when you shine the flashlight on the sensor located on the vehicle! The flashlight can easily snap back on the vehicle for storage and to carry the vehicle with you wherever you go! Play ‘n Pretty is Funrise's own line of girls lifestyle products including make-up, jewelry, dress-up, accessories, hair play and boxes and bags. 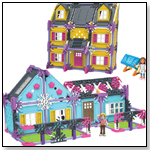 Play ‘n Pretty is a lifestyle brand for girls’ ages 3 – 6 years. All make-up products are safe and easy to clean with make up remover. Play ‘n Pretty’s Beauty Star Station comes complete with a mirror that lights up, safe and gentle make-up (eye shadow, lipstick, blush), jewelry and hair accessories. It has detachable trays and a secret compartment. This revolutionary bubble machine comes with 32 oz. of The One and Only Gazillion Bubble solution. Simply switch it on and watch in amazement as the Bubbles In A Bubble Machine blows colorful bubbles inside of bubbles! Great for parties! Requires 8 “AA” batteries, not included. This battery operated Bubble Gazooka comes complete with 8 oz. of the one and only Gazillion bubble solution. Just press the on switch, pull the trigger and watch it blow a huge stream of BIG colorful bubbles. This vehicle has working lights and realistic engine sounds with a working front arm and doors that open. Also included is a cool hat you can wear while you're on the job. Tonka Lights & Sound Front Loading Tractor comes with a figure you can place in the driver's seat. This realistic Tonka Mighty Motorized Side Loading Sanitation Truck has all the cool features of the real thing, including a lifting belt for up/down motion, opening doors with working interior lights and a figure that can be placed in the driver’s seat. 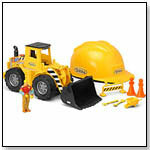 Sturdy Tonka construction and incredible detail are combined in one great vehicle. 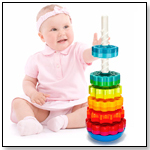 This product received a 2007 Best Product iParenting Media Award. 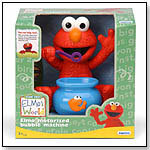 Kids will love blowing a Gazillion bubbles with their favorite Sesame Street character, Elmo, and parents will, too, since the non-toxic bubble solution won’t stain their clothing or the furniture. Simply pour Gazillion bubble solution into the reservoir, switch it on, and watch your bubble buddy blow a stream of colorful bubbles. It includes 4 oz. of solution. “Gazillion Bubbles (is) an effervescent line of bubble toys bursting with one-of-a-kind bubble solution and great bubble blowing accessories,” Kathy Hawk at Funrise told TDmonthly. Launch date: February 2007.